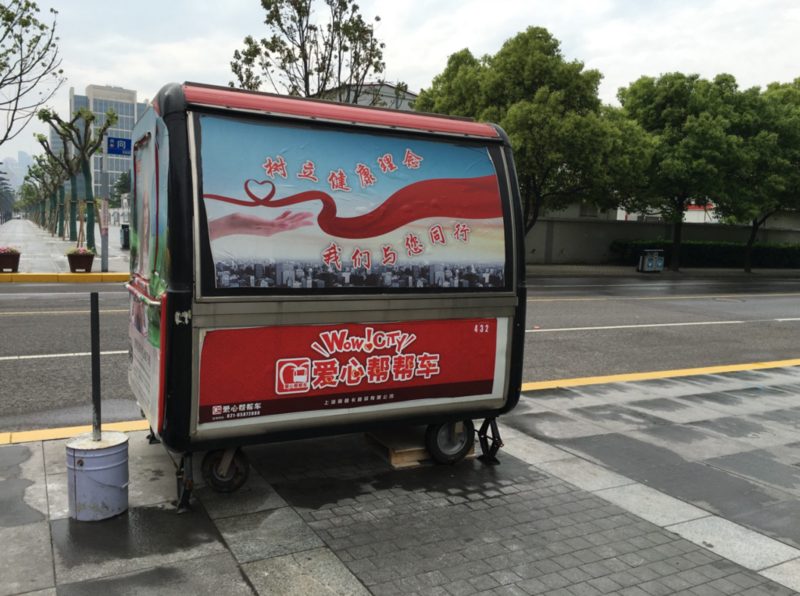 The red cart has a name — “爱心帮帮车” — which has a meaning of “the cart of love and help”. It has a typical appearance and design of the cart. 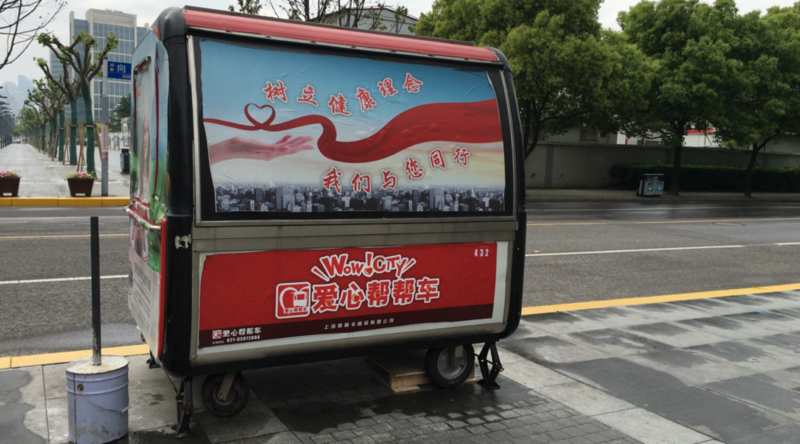 The outside is painted red with slogan of its name and the goal of the cart,such as “mutual support brings benefit”, sometimes even with the goal of the neighborhood, such as “build a ” harmonious society” etc. Sometimes the vendors will stick their menu outside too. The inside of the cart is more like the design of the common food truck that one can see in the state — collapsible, movable and utilized space. The board for cooking and placing the goods are extended from the inner part and the cover of the outside will support the board. There are shelves inside for placing either the goods or the materials for making the food depending on what the cart is selling. The red cart belongs to Shanhai Aoshika Restaurant Management Co. (上海奥食卡餐饮管理有限公司) and is licensed and kept monitored by the company. The cooperation between the company and the government is established on October 19th, 2007. The government and the company is regulated by the contract so that the Chengguan (city police) will not keep them away from the street or selling. Breakfast Cart is initially started as a government project to achieve these goals: 1. Deal with the unemployment. 2. Provide people safer and cheaper breakfast. 3. Help illegal street vendors to have a formalized stand in order to reduce the potential conflict between illegal street food vendors and Chenguan. The first experiment was in Changshou Jiedao on October 19th, 2007. 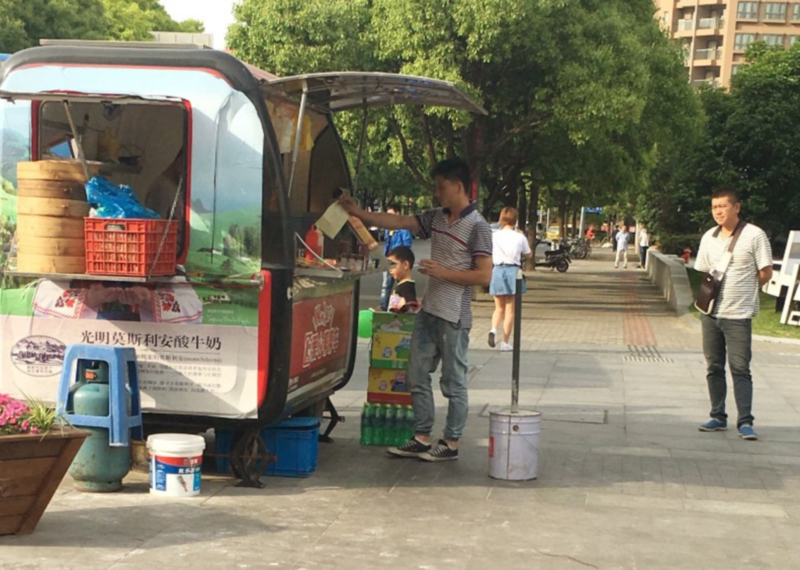 Facing the problem of street food vendors occupying pathways and road, Changshou Jiedao launched this program after listening to the advice of local residences. The original Red Cart is only a breakfast cart, and only planned to open between 6:30 to 9:30. At first there were only 30 breakfast carts, but now there are hundreds of carts in Shanghai, and the operation hours and types of food have been extended. Applying for the Red Cart can be achieved through multiple ways. Subdistrict Office — — The subdistrict office will offer such working opportunity to those who lose their job or cannot find a job. One can reach out to the “社区救助中心” to request for the job. Friends and Neighbors — — In our interview with many vendors, they claim that they start the business because their friends or neighbors work for the company first and recommended them to the business. Requirements for applying involves the health check and training of relative techniques. Chinese citizens who are 25 to 50 years. Finish the official training and intern. Start business after the final examination. Operating a red cart is a standardized procedure. The vendors all sell Baozi (包子) and soy milk (豆浆) in the morning, fried chicken for the afternoon, and Taiwan pancake and drinks for all day. Selling their own food is forbidden by the company. The materials and goods are offered by the company and they can call to order them and have them delivered to their spot. The company will also provide them certain resources for advocating, such as the loudspeaker continuously playing the record about how good and famous the fried chicken is. Their spot is assigned by the company but some of them can choose according to their preference. The health, pension, unemployment and accident insurances of the vendors are paid by the company. The basic salary is promised to the vendors and the vendors can get bonus income by selling more products than required amount. Usually the vendors start the business at 5–6 in the early morning and end the business at 8–9 in the evening. The soy milk provided by the company. They are specifically labelled in “爱心帮帮车” and are not selled in anywhere else. Multiple Government departments are involved in signing the contract. Commercial Committee of the subdistrict —is responsible for approving all the commercial cooperation and registration. Social Services Office (社区服务办公室) — is responsible for helping the people who loose their job. Social Management Office (社区管理办公室) — is responsible for the management of the street. City Urban Administrative and Law Enforcement Bureau (城市管理行政执法局) Office of Subdistrict — is responsible for inspecting and managing the street and neighborhood. When the cooperation first start in Changshou Road, the relationship and the contract is established among the company, the Chengguan, the commercial committee and the Social Services Office. However, this situation seems to vary between different districts. For example, Chengguan in Weifang District claim that they have no responsibility and relationship in this cooperation contract. The Commercial Committee claims that they are only responsible for giving the licence to the red carts and are not really “cooperating with” the company. They licencing procedure is exactly like other normal food industrial companies. The mystery of the chaos in establishing the cooperation and the contracts still remains unsolved. The street-food economy is regulated by the Chengguan (城管), also called city police. Street food stands who are not licensed, or are set on the pathway and blocking the way, will be held in custody by Chengguan and the vendors will be fined. However, with the contract between the company and the government, the red cart is registered and the vendors do not need to worry about the Chengguan. We conducted a brief interview with the Chengguan of Weifang subdistrict. The supervisor of the Chengguan claim that registered red carts will not be expelled. However, the vendors still need to keep the cart clean and tidy, which is under the inspection of the Chengguan. If the people living in the neighborhood or working in the company around complain about the noise they made, Chengguan will also ask them to move to other places to do the business. Chengguan in ECNU area seems to regulate more strictly than the Chengguan in Weifang Subdistrict. The Chengguan in ECNU area also inspect whether the red carts operate outside the legal hour. They have limited the operation hours which is 5:30 to 10AM every day for the vendors. If the vendors sell outside the time region, they will be asked to shut down. The company is working hard in extending the working hour and the area for the Red Cart Program. According to the district manager of Changfeng Area, the company plans to help vendors start afternoon sessions,which is currently forbidden by the Chengguan, with ￥1000 additional monthly payment to be charged, and the company will negotiate with the local Chengguan on behalf of the vendors. Effort in expanding this program to other districts is also made and returns good results in the past few years. The government was very optimistic and enthusiastic about this program in the perspective of solving the unemployment. In 2007, 2008, and 2009, which is the three years since the program started, the development of thered cart is always mentioned in the document of the report, year plan or the year summary of the government. (see http://csjd.shpt.gov.cn/website/pages/content_0.html?channel=16&id=108, http://csjd.shpt.gov.cn/website/pages/content_0.html?channel=16&id=129) The government, which is mainly the subdistrict office, pay great attention in the first three years to this program. They regard it as a great opportunity to help solve the unemployment problem, especially the young people who cannot find a job. They plan to establish a long-term way to regulate the carts and promote this program to other districts as well. The promotion plan was a success and now almost four to six districts have this program. Yet as the time go on, the government is no longer in favor of this kind of cooperation as before. The manager of Putuo Disctrict of the Aoshika Company said that their business once boost to around 300 carts, but they decay to near 100 now and the government is no longer so willing to working with them. A year ago, Shanghai Business Committee launched another program that promotes the franchised breakfast restaurant including the old brands like Shendacheng and popular brands like Laoshengchang. The government not only promotes them by acknowledging their food safety, but also offer them subsides to bring the price down. This program is very threatening to the business of the Red Cart. The carts are identical in the appearance and is easy to identify. The cart design is owned by the company. The uniformed cart enables people to recognize them and trust the food made there are safe and licensed. According to one vendor, the company also has request for their dressing. They should wear hat and mask when cooking for the customers. The type of food the vendors can make and trained is limited. They can only choose selling among Taiwan pancake, Baozi, fried chicken and drinks. The materials and drinks are technically provided by the company. The vendors need to fulfill the sale amount set by the company, otherwise they need to pay to the company. The materials and other goods are delivered freshly according to the amount the vendor requests, depending on the condition of selling. The safety of the material and goods in the company are all approved by the Food Safety Committee and licensed. Shanghai Aoshika Food Company has specific rule for the responsibility of food safety issues: If customers get sick because of the food they get at their cart, the company will reimburse all the medical payments and compensate them. Compared to other food franchise companies who usually let the vendors take the responsibility, Shanghai Aoshika Food Company’s rule is more responsible. The vendor is exchanging the money and the receipt with the delivery man from the company. The location of the carts are decided by the company. Sometimes vendors can make a request about the preferred location, but they need the approvement from the company. They cannot move to other location to do business without any transfer permission. The location the company choose take various factors into consideration, such as the needs of the costomers in the area, the width of the pathway and the distance from the neighborhood. The company also needs to make compromise to the government construction. For example, the one red cart is removed from Exit 6 of the metro station on the Century Avenue because of the on-going construction. See the link for the map of the red carts cluster in the Century Avenue area and ECNU area. Although the red cart seems to be a strong attempt for helping the vendors to step from informal economy and unemployment to the formalized economy, it is still problematic and is not sustainable. This unsustainability is shown in many different aspects. Different district and subdistrict has different regulation and different department taking charge of the cooperation. Originally, Changshou Road Subdistrict, the contract is signed among three departments — the Chengguan, the commercial committee and the Social Services Office, while in Weifang district, the contract is signed in none of these departments. The regulation then become messy because the Chengguan and officers do not really know how much they should take charge of the red cart program. On the other hand, the strength of regulation by Chengguan also varies in different areas. This causes the problem of unfairness between the vendors themselves. Some of them may have easier environment to do business while others do not, and yet they still have the same standard of sale amount and have to pay the same amount of money. The company cannot always inspect all the carts. Many vendors are actually selling their own food, which is forbidden by the company, without being caught. They even go to the market to buy the food materials themselves instead of ordering from the company because the first-hand materials is cheaper than those offered by the company. Also, regardless of the rule in the company, requiring the vendors wearing masks and caps, rarely do the vendors do so. Although the company will send the manager of the area to inspect their business from time to time (in Weifang area, it is 2–3 times every year), it is hard to check every spot since there are too many of them and too widely distributed. The red cart may not be the real Red Cart. Many news have reported that fake red carts appear on the street and selling things themselves without any license and registration. They obtain the similar cart from elsewhere and send the carts to the repair factory for processing. Soon they will have the red cart with very similar appearance as the offical one and people are hard to tell if not paying attention. Some vendors decide to quit the business without offical procedure of resigning, and they just leave their carts on the pathway. People then come to pick those carts for their own usage. Formalization and standardization of the food come with price. The limit food types causes monopoly inside the red cart vendors themselves. Because the vendors form a cluster around one area and they also sell very similar type of food, they are always competing with each other. However, according to the company rule, they cannot either lower the price or sell different things so their business becomes harder and harder to do. Thus many of them quited. Migrat workers are gradually returning home since the unemployment rate is higher and higher, and this causes the decline in purchasing power, which is related to the sales of their breakfast that is sold at a relatively higher price comparing to the informal breakfast stands. 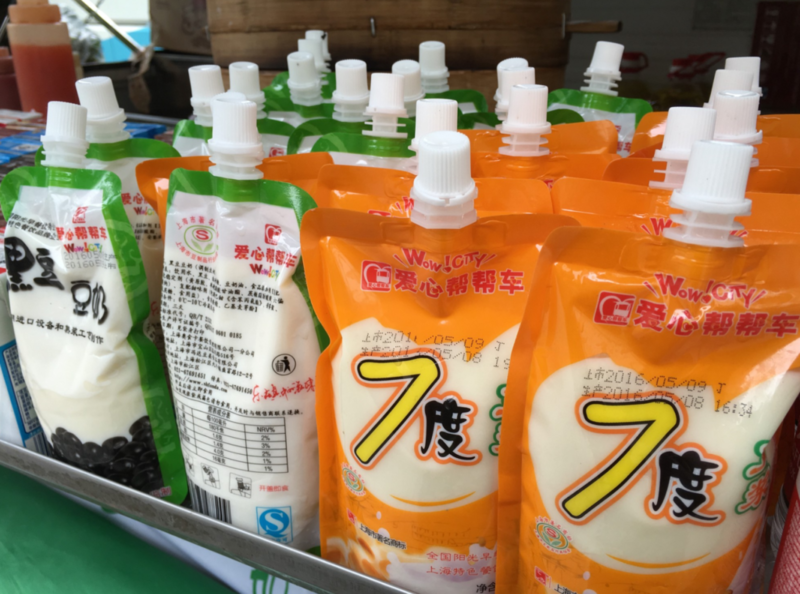 Those street vendors who are not formalized are also selling similar things for breakfast — pancake, Baozi, and soy milk — but with lower price and more various choices. The red cart vendors can hardly compete with them. Eventhough their cart propagate that their food is cleaner and safer, the customers actually do not care about it so much, a vendor claims. During the interview with the vendors, we find that many vendors have higher expectations to their job and regard this job as a temporary one. The vendor says that if there were other opportunities, people would not do this job. “Since this job is for the people living in the bottom of the society,” says the woman who operates a food cart near the exit of Metro Line 13 at Jinshajiang Road Station. The general business environment is not that good. Migration workers are gradually coming back home since the unemployment rate is higher and higher, and this causes the decline in purchasing power, which is related to the sales of their breakfast that is sold at a relatively higher price comparing to the informal breakfast stands. The Red Cart reaches a premature end sadly. It is an attempt made by the company and the government to formalize the street food vending in the perspective of solving the unemployment problem. Yet it reveals many problems in the transformation from informal economy to formal economy. It is neccessary for us to think about the question such as how to regulate those red cart vendors and how to keep the sustainability of this kind of relationship. What is the next step to formalization needs to be discussed. Whether the relationship should be establish between a food company and the government based on business profit? Moreover, the more principle question to ask is that do we need to formalize the street food vending. Vendors on Second North Zhongshan Road, vendor Li Fei and vendors on the Century Avenue, manager He in ECNU area for your interview. Weifang subdistrict for your interviewing about Chengguan and the cooperation relationship. NYUSH IMA department and ATS for equipment loaning. Professor Ana Greenspan for assisting our project. Kyle for technology support.